There are no one-size-fits-all solutions in rehabilitation; each patient is unique and each impairment different. That’s why our rehabilitation services are built on the broad experience of highly trained physical, occupational, and speech therapists. During your first visit, they’ll give you a complete assessment and ask you about your goals for recovery and adaptation. Those goals will become progress markers for you and your therapy team. Our patients are of all ages and levels of disability, and come to us for any of hundreds of reasons, from birth defect to traumatic injuries, developmental delays to disease. For each of them, we create a highly individualized plan of treatment that takes advantage of our full spectrum of practice. While our progress is usually measured in physical achievements, we are always conscious of the psychological, social, and environmental factors that impact your life. During your stay in the hospital, we will answer questions regarding your symptoms/event/procedure. We will help you identify risk factors for future events and introduce methods to modify them. Another major goal is help you identify signs and symptoms and give you instructions in the case of emergencies. Lastly, we teach you skills to manage home-activity intensity to bridge you to an outpatient rehab program in your area for continuing care. Other Diagnoses, or prevention, may be covered by some private insurance policies. *We encourage you to check with your insurance company for co-pay and deductibles, and to see if you are covered for continuous EKG-monitoring exercise prior to beginning cardiac rehab. Upon graduation of phase II, patients are encouraged to continue exercise and other healthy-behaviors just as they have learned. One option is to enroll in a maintenance program using the same facility at the hospital. This program has an out-of-pocket cost requirement that is often cheaper than most fitness facilities, while having hospital emergency staff available. Vital sign monitoring and goal updating are done regularly, but less intensively than in phase II. 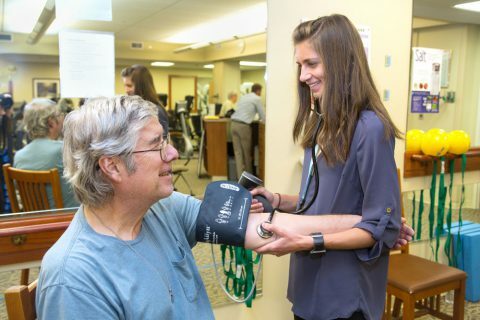 The patient is encouraged to be independent with exercise and health habits, while having education materials on these subjects readily available. Physical Therapists are trained to improve functional movement with emphasis on positioning, transfer training and use of adaptive equipment. On your initial consultation, a therapist will review your history and work with you to evaluate your posture, mobility, strength, flexibility and level of dysfunction. This initial assessment, combined with your personal goals, will serve as the baseline for developing an appropriate and highly individualized treatment plan. Treatment may include joint mobilization, soft tissue stretching, exercise, ultrasound, ice or heat, and education. A home exercise program will be designed specifically for you and your condition, as well. Physical therapists obtain a post-graduate Master’s Doctorate and pass a State Board Examination for licensure. Through continuing education and training, our therapists have the most current knowledge of treatments and procedures. Occupational therapies are treatment focusing on helping people achieve independence in all areas of their lives. This treatment can offer adults and kids with various needs, positive activities to improve their cognitive, physical, and motor skills. The desired outcome is to enhance the patient’s self-esteem and sense of accomplishment. Some people may think that occupational therapy is only for adults; children, after all, do not have occupations. But a child’s main job is playing and learning. An occupational therapist can evaluate a child’s skills for play activities, school performance, and activities of daily living and compare them with what is developmentally appropriate for that age group. According to the American Occupational Therapy Association (AOTA), in addition to dealing with an individual’s physical well-being, OT practitioners address psychological, social, and environmental factors that may hinder an individual’s functioning in different ways. This unique approach makes occupational therapy a vital part of health care for some kids. A Speech Language Pathologist is trained in identifying and treating communication and swallowing disorders. Our goal is to design a program for your individual needs. On your initial consultation, a therapist will review your history and work with you to evaluate your level of dysfunction. This initial assessment, combined with your personal goals, will serve as the baseline for developing an appropriate and highly individualized treatment plan. Our Speech language therapy is the treatment for most individuals with speech and/or language disorders. A speech disorder refers to a problem with the actual production of sounds, whereas a language disorder refers to a difficulty understanding or putting words together to communicate ideas. – Articulation disorders which include difficulties producing sounds in syllables or saying words incorrectly to the extent that other people can’t understand what’s being stated. – Fluency disorders which include problems such as abnormal stoppages, repetitions or prolonging sounds and syllables. – Resonance or voice disorders include problems with the pitch, volume, or quality of a child’s voice that may distract listeners from what’s being stated. – Language disorders can be either receptive or expressive. Receptive disorders refer to difficulties understanding or processing language. Expressive disorders include difficulty putting words together, limited vocabulary, or inability to use language in a socially appropriate way. Hand therapy helps a patient regain maximum use of his or her hand after injury, surgery or the onset of disease. Treatment is provided by a hand therapist; someone who is first trained as a physical or occupational therapist and then receives additional training in hand therapy. Hand therapists teach exercises and create custom treatments to help the hand heal and protect it from additional injury. Wound care treatment is designed to ensure that breaks in the skin heal as quickly as possible with minimal scarring. Wound care treatments may be advisable for surgical incisions, abrasions or scrapes, bites, cuts, lacerations or punctures. Wound care treatment may include dressing changes, debridement and use of the Wound Vac® system to help speed up the healing process of a wound. Our Pediatric Rehabilitation Services have been developed to help children overcome difficulties with motor skills, coordination, communication, socialization and a host of other life skills. Our therapies are based on recognizing an underlying medical cause and treating both the cause and the symptoms. Clinical therapy is often more intensive than school-based therapy and is therefore often more effective. Our therapies can help correct a small problem before it becomes a big one or help differently abled children learn to live more independent lives. Appointments may be scheduled by calling, Monday through Friday, from 8:00 a.m. to 5:00 p.m. Appointments are available between 7:00 a.m. and 6:30 p.m.